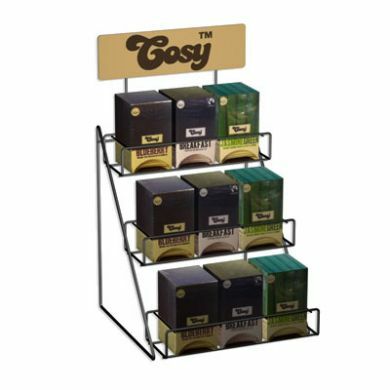 Cosy Black Metal Display Tea Rack with Cosy branding. Ideal for commercial Point-of-Sales use. Holds up to 9 boxes of tea. Height: 50cm at highest point, 35cm at lowest point. Please note: Tea not included. Inspired by the recent renaissance in knitting, we worked with local knitters to create patterns for each of our teas. If you look on the side of the pack you'll see the knitter's name and the stitch used! While the look and feel of the tea was important, the taste was paramount. The organic leaves in each individually wrapped bag bring the full flavour into your cup. Beyond the Bean have come a long way from their humble beginnings in 1997 when the whole business operated from their home-office and their customers were a few small coffee bars in Bristol. They now operate in 50 countries and occupy a large warehouse facility, filled with syrups, smoothies, hot chocolate and frappes - pretty much everything a coffee shop needs apart from the beans!